Motivation is the most crucial element in all successful endeavors. Relationships, business, and athletic endeavors require that extra something to keep them going strong and to help them last a long time. Successful bodybuilders like Arnold Schwarzenegger, Frank Zane and Ronnie Coleman have always used little secrets to keep them moving on to the next rep, the next workout, and the next step to bodybuilding immortality. As a human being, you are naturally driven. You want to know more, do more, see more and be more. In bodybuilding, this desire to go beyond is easy to achieve. It’s all about setting goals. This week you go into the gym with a goal of bench pressing 225 pounds of weight eight times. Last week you were able to lift it 6 times and you just know that this week you’ll hit eight or even nine reps. Every time you walk into the gym, you should have a goal in mind, and you should have a mentality that says I will accomplish that goal. There will be times when you fail, but that should never stop you. Thomas Edison failed thousands of times with his inventions, yet he’s one of the most well-known men in history. If you want to stay motivated in the gym, have a goal set for every time you walk into the gym and stick to it. Get motivation from the best ever quotes about inspiration, and get started. Working out for hours on a weekly basis may not seem like a very important goal or task. This holds true for many people throughout the world. You may start to feel like working out is just wasting time that could be better spent with friends or family. When these thoughts enter your head and lead to lower levels of motivation, you have to remember why you’re working out. Sure, working out with weights make your body look good, but there are a host of benefits associated with working out. Get motivated to lift those weights again and again! Working out keeps your heart strong, which means you will decrease the risk of heart attacks and strokes. It helps you keep fat levels down, which means you will avoid diseases like Type 2 Diabetes, high cholesterol and hardening of the arteries. In men, working out with weights also helps to keep testosterone levels higher – which means more fun in the bedroom. If you think your time would be better spent with family and friends you’re wrong. You need to stay motivated to workout so that you will live longer and with a higher quality of life so you can enjoy your family and friends for as long as possible. If you find that motivation is a problem for you, maybe it’s your gym or your workout routine. If your gym doesn’t offer a variety of equipment or if the equipment is always being repaired, that will certainly lead to a lack of motivation. Who wants to go to a gym where nothing works? That’s no way to gain muscle or have fun. Have you been doing the same routine for weeks, months or even years? If so, change it up. There are many different routines that can be incorporated into a workout. Push-pull routines, German Volume Training, split routines, or upper body and lower body workouts. This is just a small list of the many options available to you. By changing your workout, you will not only increase your motivation, but you will probably see an increase in strength, endurance, and lean mass. If you’re looking for more motivation, make your workout routine a fresh and exciting challenge. Music has a great effect on emotions. It can lift you up or bring you down. If you are tired of the songs you normally listen to, seek out some music specifically made for working out. If you normally work out without music, consider adding it to your workout. It can make your workout go by in a flash and you can even add a little cardio to the mix if you get a song that makes you want to dance between sets. Bodybuilding is really a solitary endeavour. All exercises are done alone, there is no team, but there are no rules that say you can’t workout with a buddy. Find a workout friend at the gym or elsewhere and challenge each other. See who can get the most reps with a certain amount of weight, or who can lift the most weight. 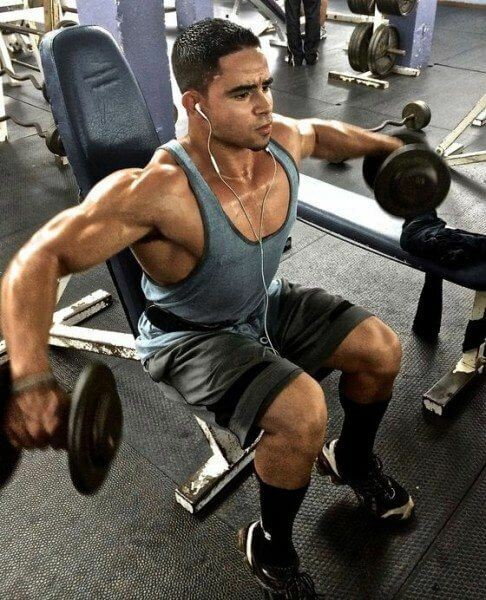 Let your friend act as a spotter and then go all out by lifting as much weight as you can. You know you’ll be safe because your friend will help you lift it up or lift the weight off you if necessary. Working out with a friend will give you things to talk about during sets and give you the bodybuilding motivation to lift more weights and maybe workout for a longer time. There are many ways to motivate yourself in the gym. The secrets listed above are just a few examples. True motivation comes from within. All the great bodybuilders had one thing in common. They had an overwhelming drive to succeed. They wanted to be the best. Bodybuilding is one sport that always allows you to go one step further, lift a little more, get a little stronger and succeed.